The Enigma Gem was the prize possession of a pirate known as Captain Dead-Eye. No one knows where he obtained this Gem, but it is said that as he lay dying of a poisonous spider bite in his Captain's quarters, he held the Enigma Gem to his chest, speaking only in bird calls. After he died, the crew tried to recover the gem from his body, but it was nowhere to be found. The House at 181 South West Eliptica Street is said to have been built from wood salvaged from Captain Dead-Eye's ship. Reports of horrific experiences by multiple families eventually led the house to become permanently abandoned. A psychic artist recently drew this map while in a trance. No one has dared to enter the house and attempt to follow these instructions. 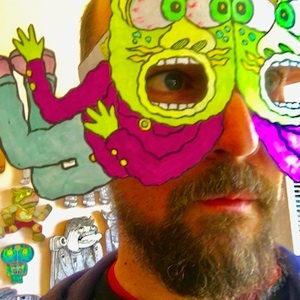 Theo Ellsworth makes comics, art zines, illustration, and woodcut fine art. His books include Capacity (Secret Acres, Brooklyn) and An Exorcism (Kuso Komikss, Latvia). His zines include Imaginary Homework, Antidote, and Logic Storm. He is the House Artist for the London-based record label, Astral Industries. One of his woodcut pieces recently traveled all over the United States with author Jeff VanderMeer on the book tour for his new novel, Borne. He currently has a solo exhibition of his woodcut art called “Haunted Helpers” on display at the legendary LA gallery, Giant Robot.